3.2 out of 5 based on 166 bloggers and 23 commenters. You need to replace the neutral Feedburner ID with yours that make the email suscription box work. 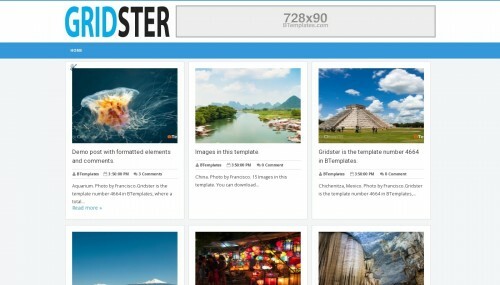 Gridster is a free blogger template with 2 columns, responsive design, seo friendly, right sidebar, gallery-styled, minimalist, an exclusive design for Blogger, ads ready, social bookmarking icons, posts thumbnails, breadcrumbs, pagination, related posts support, well designed threaded comments and neutral colors. Excellent template for blogs about to use as a base to create your own design, photography or a personal portfolio site. To change the static page layout so that it is full width the same as the post layout follow the below instructions. I like this template but I encountered 2 problems, thumbnail/images of my posts at homepage and related posts did not show up. Please help. I’m hoping you can help me resolve the issue. Thank you! This template is very good. Why only show four post? sorry this is what bloggeris telling me when im tryingto upload this theme i have downloaded the viral theme “We were unable to save your theme. I like this template but I encountered 2 problems, thumbnail/images of my posts at homepage and related posts did not show up. halaman Pertama kenapa cuma 5 Postingan….? Why navigation menu in mobile not working? any help? Gridster © 2016 – All Right Reserved how to edit???????? This one is very nice template. I always download from your site.